Nozzle (snorkel) style vacuum sealers provide the most versatile method for vacuum packaging. Stainless steel nozzles extend into the bag and vacuum out the air. PAC’s industrial vacuum sealers can be equipped with gas flush for modified atmosphere packaging (MAP). Most vacuum sealers allow for the vacuum packaging of one or two bags per cycle depending upon model and bag specifications. Specialized sealers with multiple nozzles allow for multiple bags to be sealed per cycle. 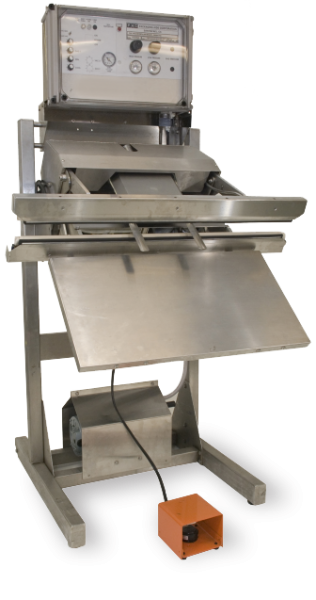 At PAC we manufacture a range of industrial vacuum sealers depending on the requirements of the application. Vacuum sealers are perfect for extending the shelf life of food, protecting delicate components, or medical device applications that require validation of all process parameters. All of our industrial nozzle vacuum sealers are made in the USA at our factory in San Rafael, CA and come with either a 2 or 3 year limited warranty, depending on the model. Our general purpose vacuum sealers are designed for a range of industries including industrial, automotive, food, chemical, and parts manufacturing. Validatable medical vacuum sealers are designed to work in most medical and pharmaceutical packaging applications. PAC’s food vacuum sealers are specially designed to meet the needs of the food industry. PAC Machinery offers several vacuum sealers for the coffee industry. These sealers vacuum sealers come standard with gas flush for modified atmosphere packaging (MAP). With the need to vacuum packaging powders and other products in explosive environments, PAC has developed. Nozzle vacuum sealers from Packaging Aids are used by these and a large number of other leading businesses and institutions.